For richer or for poorer, for better or for worse, virtually everyone at one time in his or her life utters the fateful words: "I do." Many of us live to regret these words, but as Charles Darwin noted in his journal: "There's many a happy slave." 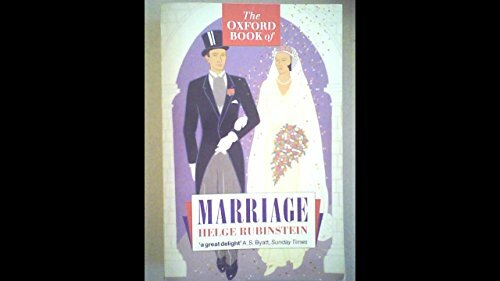 Now, in The Oxford Book of Marriage, Helge Rubinstein takes us "happy slaves" on a truly special tour--both richly intimate and at times wildly amusing--of the many faces of married life. It's all here: the first meetings and courtship and proposals (such as Mister Collins's absurd proposal to Elizabeth Bennet in Pride and Prejudice) through the many ups and downs of married life until "death do us part." Here readers will discover Queen Victoria the day after her wedding, feeling "the happiest, happiest Being that ever existed." And Karl Marx's daughter describing her elderly parents' marriage: "When they were together they were young again, she a loving girl and he a loving youth, on the threshold of life." Of course, not every marriage is pure bliss: witness the total war in a scene from "Who's Afraid of Virginia Woolf?" or Sofia Tolstoy's bitter reflection in old age: "For the whole of my life I have single-mindedly and unwaveringly loved a man who was utterly selfish and returned all my feelings with a withering and pitiless scorn." And yet Chaucer's lusty Wife of Bath, who spoke from experience about the misery and woe of marriage, could exclaim "Blessed be God that I have wedded five! / Welcome the sixth, whenever he appears. / I can't keep continent for years and years." And Winston Churchill could write to his wife Clementine: "My greatest good fortune in a life of brilliant experience has been to find you and to lead my life with you." In compiling this marvelous reader, Rubinstein has combed novels, love letters, poems, plays, and memoirs, providing a kaleidoscope of marraige that spans over two thousand years. There is much here that amuses, much that moves, much that comforts. The Oxford Book of Marriage will make an especially thoughtful and unique shower, wedding, or anniversary gift. It is the kind of book that becomes a treasured keepsake, read and reread over the years.